By Dan Ambrose: IBf/WBO heavyweight champion Wladimir Klitschko (55-3, 49 KO’s) will have a big size advantage over WBA heavyweight champion David Haye (25-1, 23 Ko’s) when the two enter the ring next month on July 2nd. Haye has cut his teeth at the cruiserweight level, where he was one of the best fighters at that weight for a short period of time before moving up to the heavyweight division in 2008. But Haye, 6’2″, is little bigger than recent Wladimir victim Eddie Chambers and this may present a problem for Haye in trying to cope with the much bigger 6’6″ 247 pound Klitschko’s size. Steward is 100% correct. Haye literally has to gamble if he wants to beat Wladimir by bum rushing him because he won’t be able to land his shots from the outside and he can’t box Wladimir, because Haye lacks the height and reach to land his jab from the outside. It comes down to Haye taking a big risky gamble by charging after Wladimir and hoping to score a big knockout shot or at the very least one that stuns Wladimir enough for Haye to finish him off with a flurry. Having no other chance to win other than to get lucky with one big shot, Haye isn’t in a good position to in this fight. 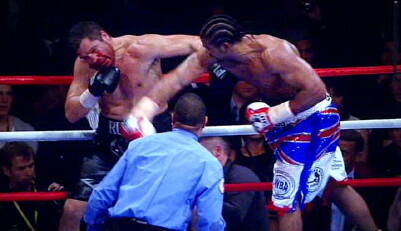 He really has to go for broke it’s unclear whether Haye has the temperament to do that. He’s looked timid in most of his heavyweight matches even though he’s been matched against mainly old fighters.